This week it's my turn at The Kraft Journal to post a tutorial. Earlier in the week I posted my Valentine Book of Love here on my blog. 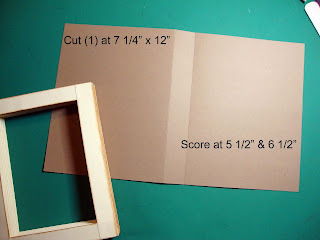 For todays tutorial I'm going to show you how to make the faux book card. You may have seen these while surfing. I love unique folds and card shapes and this one just grabbed hold of me and wouldn't let go! I got the basis for my pattern from a very talented Norwegian lady named Wenche. You can find her tutorial for this card here. I was so excited when I found the tutorial. Unfortunately, Google's translator left a little to be desired with the instructions. I know that my card is probably not in scale with hers, but that's the beauty of it. You can alter the measurements to suit your own needs. For my card I cut two pieces of the yummy linen textured Buff Ivory Cover weight cardstock from the Kraft Outlet store at 6 3/4' x 9" and two at 5 1/4" x 9". 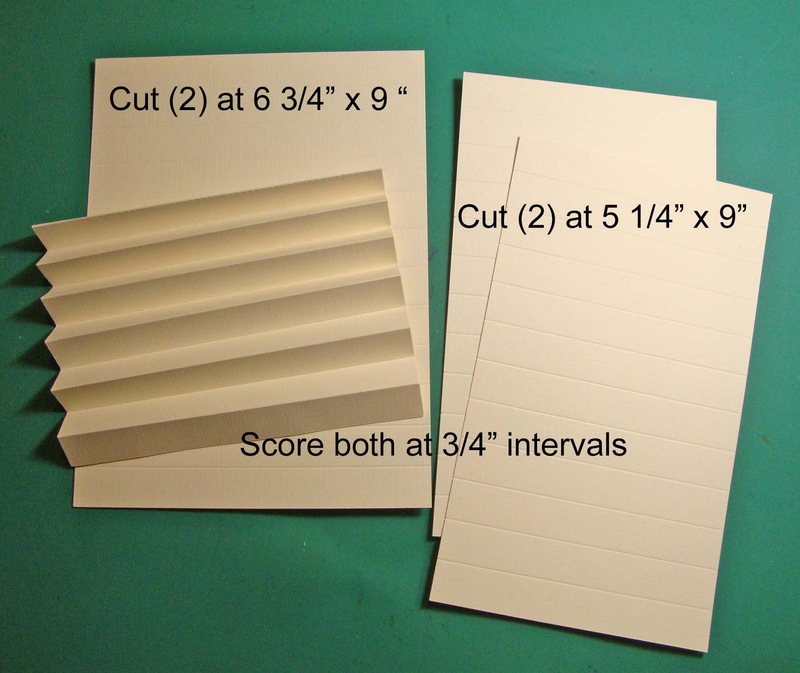 All four pieces are scored at 3/4" intervals on the 9" side. Note: a wonderful Norwegian lady named Anne, graciously offered to translate the original instructions for me. 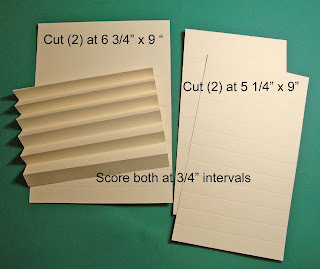 To make the "pages" correctly, you would actually turn the paper over after the first scoring and score inbetween the 3/4" scores. The only difference this makes is that you'll have more folds or "pages". Totally up to you. 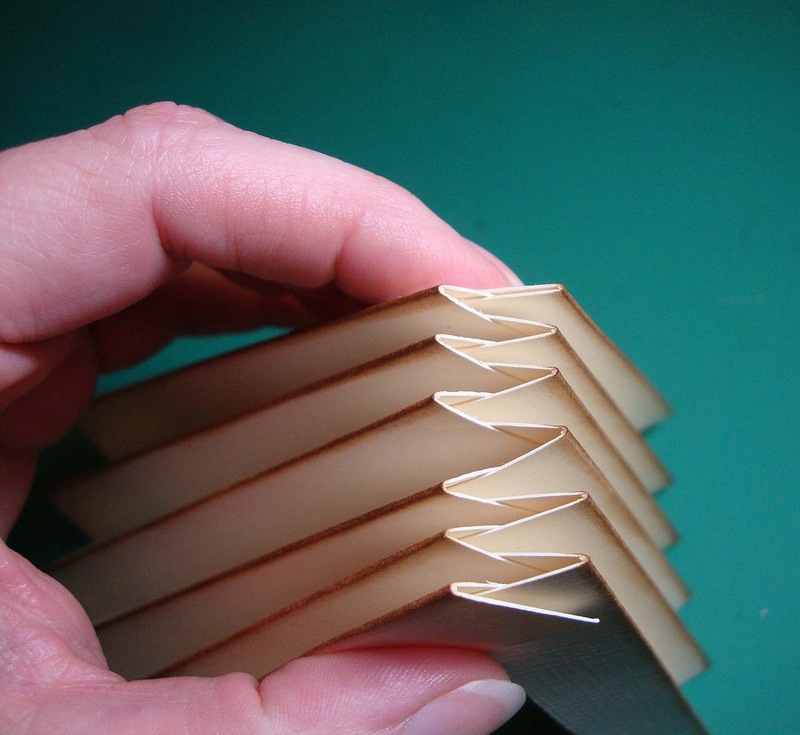 After you have all your pieces cut and scored, accordion fold the pieces. Tip: the neater and more precise you make your folds the nicer the page edges will look. For my project I inked the mountain folds of all four pieces with Vintage Photo Distress ink. After inking you need to "marry" one of the long and one of the short pieces. It's easier to get this process started by putting the two pieces together at an angle. The folds will naturally seek out their partners. After the two pieces have gotten hitched you can straighten them and make the corners flush. Just gently work the paper until you have a tight fit. To hold the sections together you need to add adhesive to the outside flap. Make sure you glue ONLY THE OUTSIDE corner. 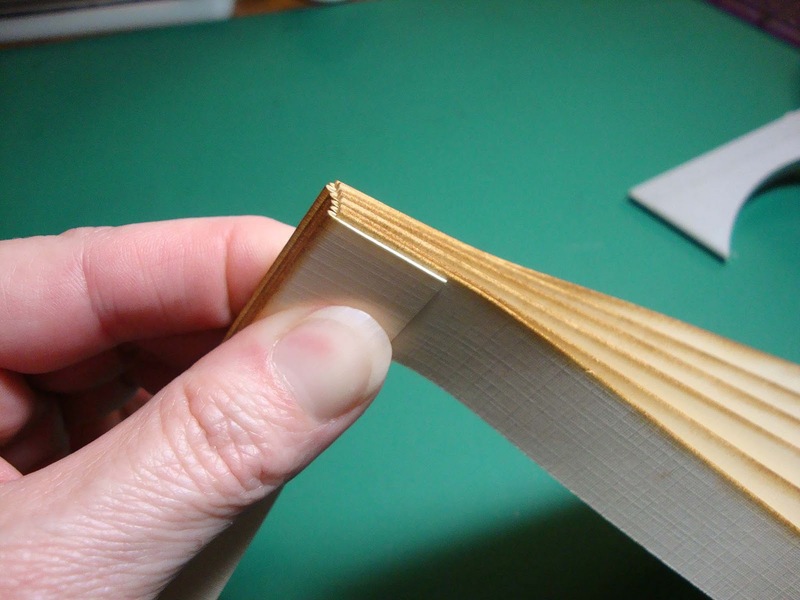 You want your pages to be loose and flexible. You'll find when you finish that you can actually play a little with the volume of the pages by either pulling out or smashing them in . Try to keep your two pieces as perpendicular as possible. You want your pages to be square not wonky. Here's what the finished "box" looks like. Tip: Make sure you match your accordion section sides. 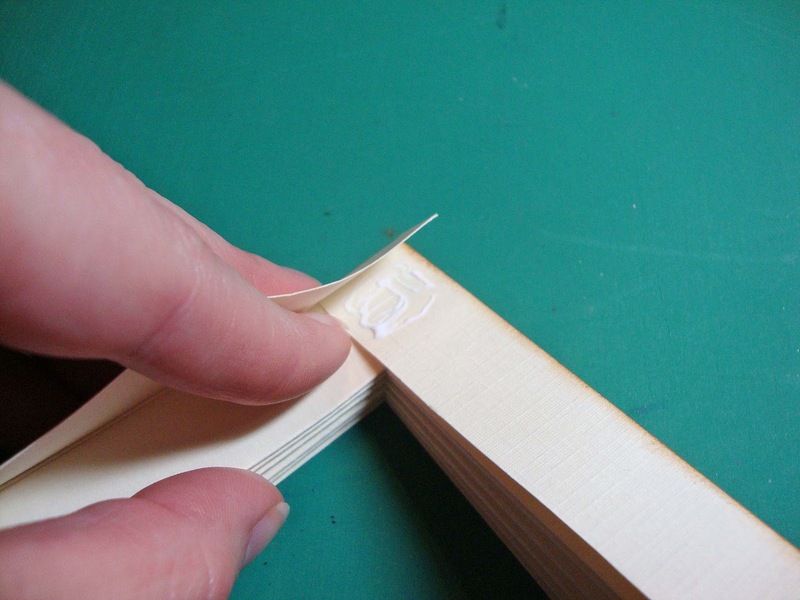 For instance on mine, you can see that the outside flap of the two long sides of the box are on top in the corners. You'll need a cover for your book card. I've used a 12" x 12" piece of kraft paper cut to 7 1/4" x 12". I left a 1" spine in the center. I believe Wenche's was maybe 2"? I can't convert Metric in my head plus the translation on the measurements was clear as mud. Regardless, her projects are incredibly beautiful and I muddled through with my own measurements. The box will sit on the right hand side of the card, flush up against the 6 1/2" score line. 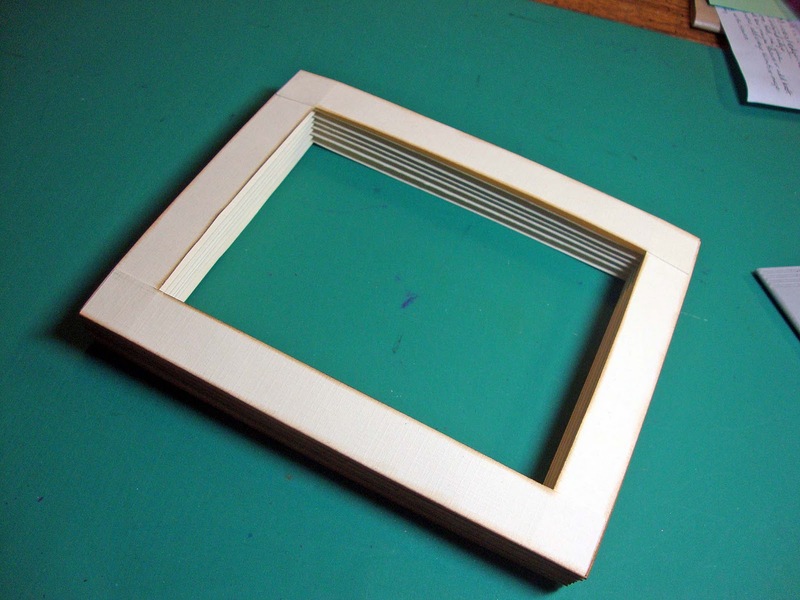 If you want a mat under your box make sure you attach it to your page before you attach your box. You can use this for a gift box anytime. Chocolates for Valentines. A mini album. A special gift. Whatevah! You can get a complete supply list for the finished project here on my blog and you can watch my video here and actually watch me put the pieces together and see the completed project cover to cover. My finished project uses several other products from Kraft Outlet like the Brown Kraft Cover Weight Cardstock, Lunch Bag Kraft Text Paper, Precut Chipboard Full Sheet, 7 Gypsies Victoria Seam Binding.and some fun Gold Scratch Off Stickers. Hope you like the project and give it a try. WOW!! What a wonderful Tutorial.. When ever I get some extra time.. I would love to try this.. Thanks for sharing it with us!! It's a wonderful project!! 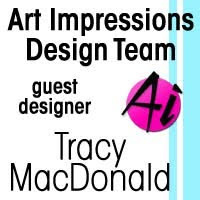 Super cool Tracy!! Thanks for doing such a great tutorial, I'm gonna have to try this one! What a clever project - thanks for sharing how to do it!! I'm such a novice at folding but want to get better! Fabulous tutorial! Will definitely keep this in mind for future reference! Tracy you are just way too smart when it comes to unique tutorials! I am always amazed with what you come up with. This is another example of a project I must try. Vielen Dank für die Anleitung, sie ist super! I was looking for a tut about book cards and...here i am! Thank you very much, it's been very useful for me this evening!